Everyone has been feeling it lately: changes in mood, exhaustion, getting sick. Transitioning from one season to another can be difficult, and we often don't realize the strain it can put on our body and mind. One big thing to also remember is how weather affects your skin. 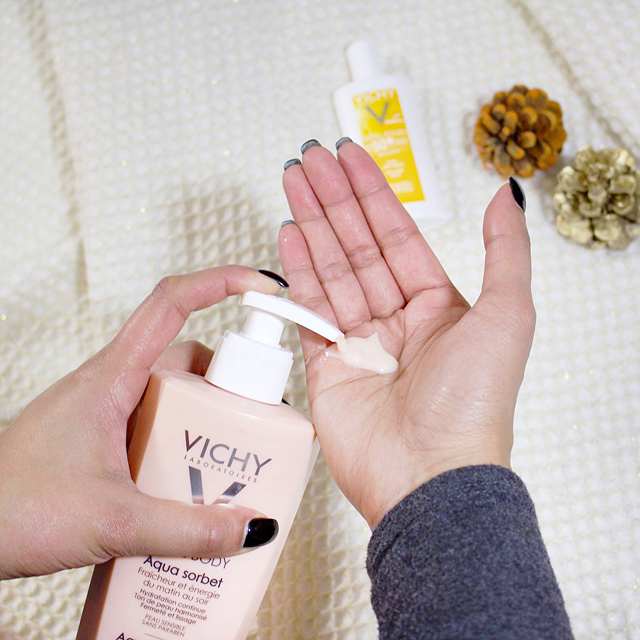 After recently joining the VICHY University (Phase Two) webinar a couple of weeks ago, there were a lot of things I learned + key tips that I'm sharing with you to help as your skincare routine adjusts from summer to fall/winter like mine. Many of us are guilty of this, but I love a good, loooong shower with hot water pouring down my back. However, we are faced with a lot of dryness and dehydration, more so in the colder months, that you have to be careful not to feed that more and moisturize as much as you can. Dr. Sonya Abdulla, dermatologist and beauty expert, recommends limiting hot tubs, steam room and sauna and opting for short, warm showers instead for your daily skincare routine. I also recently switched to the VICHY Ideal Body Aqua Sorbet as my go-to moisturizer; it has hydration, adds freshness to my skin and helps with firmness. There is no right or wrong answer for how often you should exfoliate, it depends on each individual's skin and the product(s) they are using. The most simple way to adjust your exfoliation routine as the season changes from summer to fall/winter is to decrease by 30-50% and use less aggressive exfoliation. If you exfoliate 4-5 times a week, try going down to 1-3 times a week to help your skin breathe and create natural oils for it to protect itself from the cold. Another tip I learned from Dr. Abdulla is to avoid wipes; they can be harsh and dry up the skin more than it needs to be. This is self-explanatory, but just like summer time and even if you don't mind getting a tan or having golden-bronze skin, you should ALWAYS consider sunscreen. The short and long-term damage from the sun is definitely not worth it, friends! If you enjoy a moisturizer that is light and doesn't feel thick or sticky, I'd recommend VICHY Ideal Soleil SPF 50 Ultra-Light Sunscreen. It works well when layering with daily moisturizer and/or makeup, and has protection to keep you covered for the day. Hyaluronic acid is your best friend! I'll admit that until last winter, I didn't think to check my hydration levels often or ensure to switch to skincare products that have more hydration and protection. I experienced an unnecessary amount of dry patches back in January, and thankfully, the dermatologist recommended adding a few more products to my routine that were enriched with hyaluronic acid. Before the fall arrived, I made sure to do something similar so my skin doesn't suffer when it is really cold. "Hyaluronic acid is helpful year-round; the vehicle in which it is mixed can add additional hydration in the winter months. 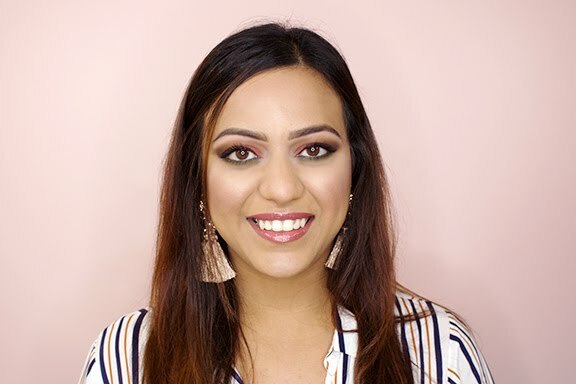 Summer may include gel-based hyaluronic acid or water-based lotion, whereas in the winter, look for a cream-based delivery system," Dr. Abdulla says. Lately I have been OBSESSED with VICHY Mineral89. 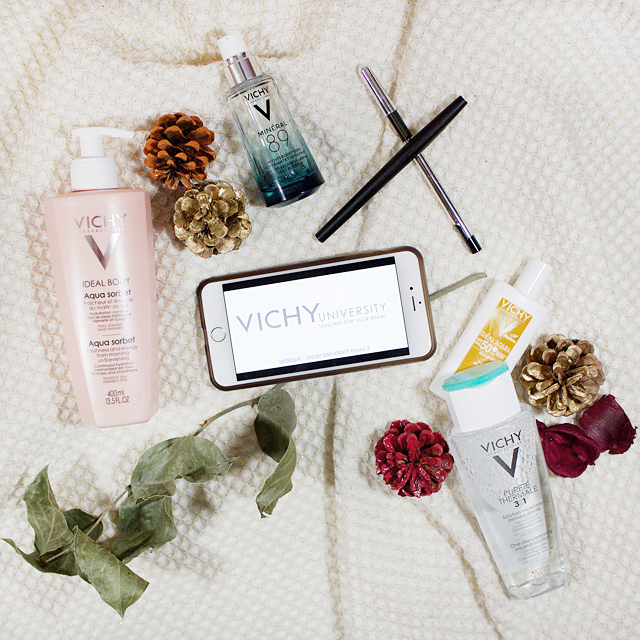 It consists of VICHY Mineralizing Water + Natural Hyaluronic Acid; both act together to hydrate, plump and fortify the skin. The best part for me is how quickly I have been able to add it to my daytime + night-time routine. Just two (small) pumps, applied all over the face after cleansing, and you are good to go! One quick tip I learned during the VICHY University Webinar is that you can also use Mineral89 to prime your lips. Before applying your matte lipstick or liquid lipstick, dab a little bit of this stuff on your lips and let it soak in. 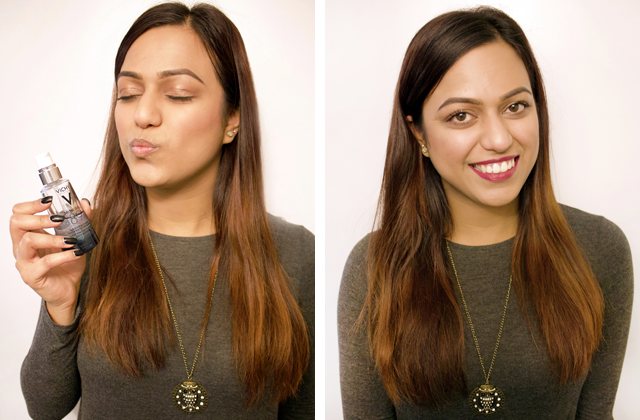 You'll be amazed with how they plump up + keep your lips hydrated throughout the day. Look for hyaluronic acid in your products - I highly recommend Mineral89! Did you find these skincare tips helpful? Let's chat on Instagram or Twitter! This post was kindly sponsored by VICHY Canada.